Posted by Camilo Bermudez Noguera on Sunday, December 17, 2017 in Big Data, Computed Tomography, Magnetic resonance imaging. Bermudez, C., Probst, V. N., Davis, L. T., Lasko, T., & Landman, B. A. (2017). Opportunities for Mining Radiology Archives for Pediatric Control Images. arXiv preprint arXiv:1712.02728. A large database of brain imaging data from healthy, normal controls is useful to describe physiologic and pathologic structural changes at a population scale. In particular, these data can provide information about structural changes throughout development and aging. However, scarcity of control data as well as technical challenges during imaging acquisition has made it difficult to collect large amounts of data in a healthy pediatric population. 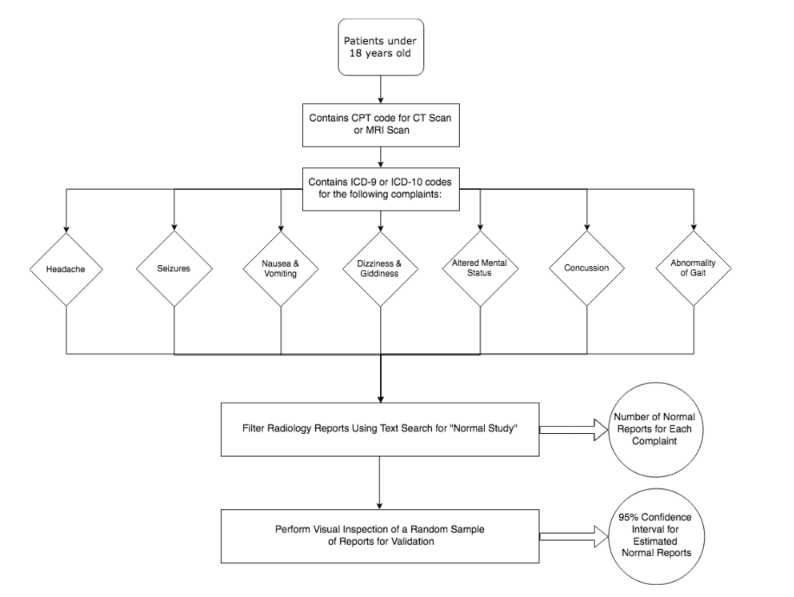 In this study, we search the medical record at Vanderbilt University Medical Center for pediatric patients who received brain imaging, either CT or MRI, according to 7 common complaints: headache, seizure, altered level of consciousness, nausea and vomiting, dizziness, head injury, and gait abnormalities in order to find the percent of studies that demonstrated pathologic findings. Using a text-search based algorithm, we show that an average of 59.3% of MRI studies and 37.3% of CT scans are classified as normal, resulting in the production of thousands of normal images. These results suggest there is a wealth of pediatric imaging control data which can be used to create normative descriptions of development as well as to establish biomarkers for disease.